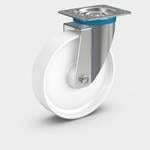 Newco Industrial Services is proud to be the United States distributor for Raeder Vogel wheels and casters. 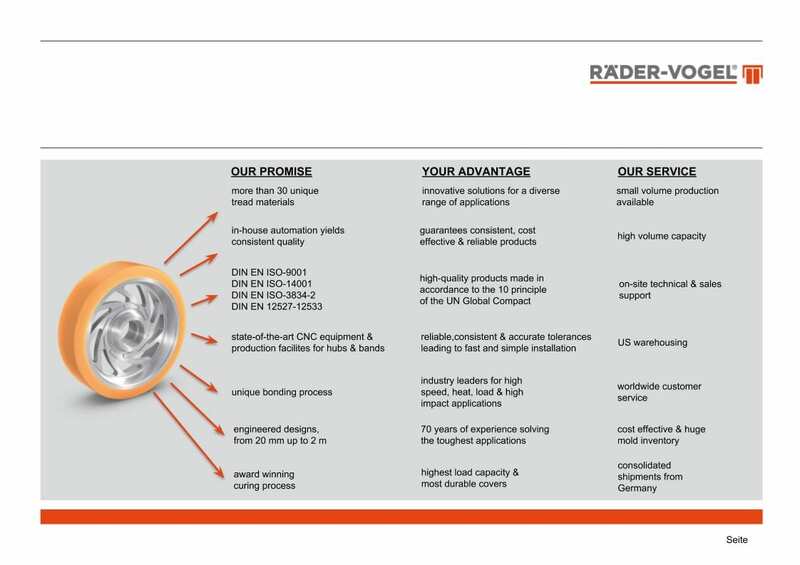 Since 1946, Raeder Vogel has been manufacturing high-quality wheel materials for a variety of applications. As the distributor, we can offer our customers a wide range of wheel treads and industrial casters for in-plant transportation. Raeder Vogel’s wheels are non-marking, have low starting and rolling resistances, and good chemical resistance to mineral oils and greases as well as various solvents, with speeds up to 16 km/h (6km/h standard) and load capacities up to 25,000 kg. Thanks to their resistance to various environmental effects, they are used for machines and devices of all kinds, as well as for work platforms, transport trolleys, assembly trolleys, storage trolleys, and container wagons. Background: For many years Newco Industrial Services has supplied, manufactured, and redesigned wheels used in automotive manufacturing carriers, elevators, drive wheels, and pre-treatment shuttle systems. These applications push the cover formulas and wheel designs to their limits and when they fail it is costly for the vehicle manufacturers. 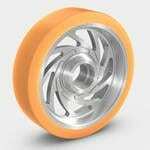 Over time, Raeder Vogel wheels have proven to be the most durable and reliable wheels in the world. 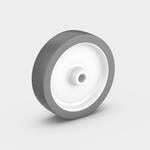 So, in 2018 NIS became the US distributor for Raeder Vogel wheels, casters, and press-on bands. Raeder Vogel’s Vulkollan is the only Vulkollan formula to have received a best formula award from the chemical supplier Bayer. Couple this formula with the Raeder Vogel proprietary bonding process and you have the best wheel in the world. 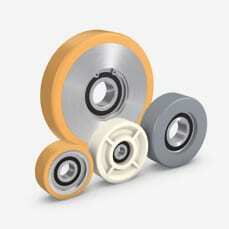 Since 1946, Raeder Vogel has been supplying polyurethane wheels to all industries around the world. Decades of experience ensures customers that they have a trusted partner that provides world class solutions to difficult applications. 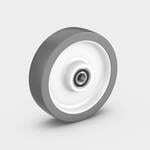 Our wheels and rollers are exposed to increasingly high stress levels. Use in continuous operation at speeds of over 22 km/h with high acceleration, high ambient temperatures, and extremely dynamic ultimate loads, places considerable demand on our products. In response to these conditions, we developed our new RV-COMPOUND® bonding system to exploit the full potential of our tread materials. RV-COMPOUND® has a high temperature resistance beyond the melting point in a wide range of different wheel treads, so it extends the load-bearing reserves for existing wheel designs and enables higher nominal loads for new designs with adapted configurations. It therefore considerably extends the lifespan of our products. Furthermore, no solvents are used in processing the bonding system, thus ensuring a considerable improvement in environmental protection as well as reduced exposure for our employees. 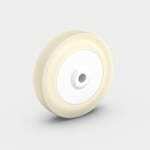 RV-COMPOUND® is used for the production of all of our VULKOLLAN® and polyurethane wheels and is processed automatically using specially designed systems. 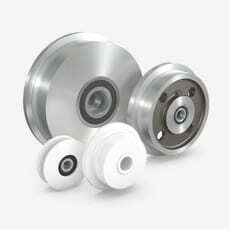 We provide you with drive, load, and guiding wheels, as well as the highest quality and durability for almost every industry and a wide range of applications. 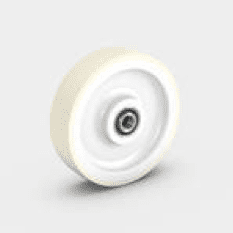 Drive wheels have a fixed connection between the wheel and axle and thus ensure the required transmission from the engine to the ground and of course can be accelerated and braked. This means that you are free to decide which type of connection you would like to use. For example, you can choose from borings, grooves, and recesses for clamping kits. 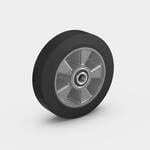 Due to their structure and function, drive wheels are generally not built on casters. 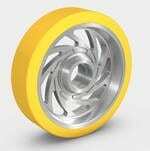 Load wheels are predominantly used for bearing loads. 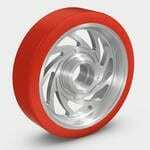 Due to their continuous connection between the wheel and axle, they also turn and, in contrast to drive wheels, can neither be braked nor accelerated. 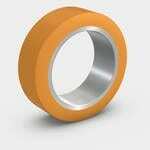 We can decide on the bearing to be used with the individual customer. In addition to the most frequently used ball bearings, we also offer you sliding bearing arrangements and roller bearings as well as customer-specific special solutions. It is a good idea to build these on casters. 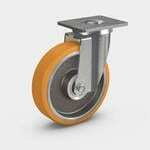 Guiding wheels are used in cable guide rollers and side guide rollers. For example, these wheels are used to guide cables or entire machines, or to absorb shocks ensure a nearly continuous connection between the wheel and axle. We produce one of the largest ranges of VULKOLLAN® and PEVOPUR® tires. Most of the standard metric and inch dimensions are in stock or can be supplied within a short period of time. Cylindrical steel band – tires are produced as standard products with diameters ranging from 100 mm to 920 mm and load capacities up to more than 10 t.
In order to ensure a better pressing on of the steel band tires the inner ring is turned out and produced with slightly smaller dimensions than the specified ones for rims with fit h11. Cylindrical VULKOLLAN® press-on tires (93° Shore A) with machined steel band for rims with fit h11. VULKOLLAN® press-on tires (93° Shore A) with cast-in steel band. With conical base tire, centre split (km) or laterally split (ks). Cylindrical PEVOPUR® press-on tires (93° Shore A) with machined steel band for rims with fit h11. Cylindrical with steel wire core and plain profile. Solid rubber press-on-tires with cross-country profile or non-marking are available on request. 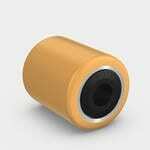 Special rollers are manufactured with diameters ranging from 30 to 85 mm and load capacities from 10 to 490 kg. 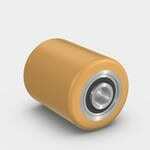 The bearings are sealed on both sides and are molded into PE·VO·LON® or PEVOTHAN®. 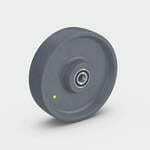 Special VULKOLLAN® rollers with a roller body made of steel, direct bonded tread, and with force-fitted or caulked deep groove ball bearings, are produced with diameters ranging from 40 to 150 mm and load capacities from 55 to 1030 kg. 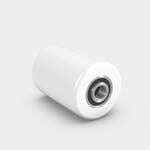 PEVOLON® conveyor rollers with ball bearing Roller body made of high-quality thermoplastic polyamide molded around the ball bearing (/5). 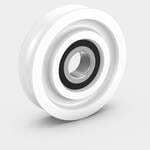 PEVOLON® single flanged rollers with ball bearing Roller body made of high-quality thermoplastic polyamide molded around the ball bearing (/5). 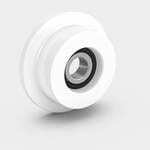 PEVOLON® grooved wheels with ball bearing Roller body made of high-quality thermoplastic polyamide molded around the ball bearing (/5). 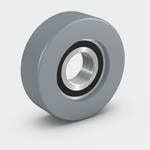 PEVOTHAN® conveyor rollers with ball bearing Roller body made of high-quality thermoplastic polyurethane (96° Shore A) molded around the ball bearing (/5). 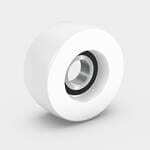 PEVOTHAN® Heavy-duty conveyor rollers with ball bearing Roller body made of high-quality thermoplastic polyurethane (98° Shore A / 78° Shore D) molded around the ball bearing (/5). 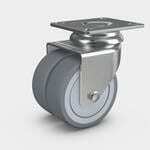 Roller body made of steel with force-fitted roller bearing (/5) and direct bonded VULKOLLAN® tread (93° Shore A). 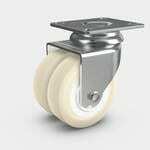 We offer one of the largest ranges of pallet rollers in Europe. We produce VULKOLLAN®, PEVOPUR® and PEVOLON® pallet rollers for most of the standard electric narrow aisle and industrial trucks as well as for hand pallet trucks. According to the application requested, different sealing systems made of zinced steel or polyamide ensure an additional protection of the ball bearings and guarantee a long service life. 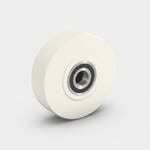 PEVOLON® pallet rollers with ball bearings Roller body made of high-quality thermoplastic polyamide with ball bearings. PEVOLON® pallet rollers with sealed ball bearings Roller body made of high-quality thermoplastic polyamide with ball bearings. Plastic sealing and V-ring gasket for protection of the ball bearings against splash water and foreign matter. 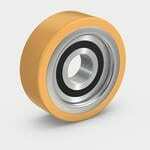 VULKOLLAN® pallet rollers with ball bearings Roller body made of steel tube with ball bearings. Direct bonded VULKOLLAN® tread (93° Shore A). 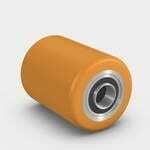 VULKOLLAN® pallet rollers with sealed ball bearings Roller body made of steel tube with ball bearings. Direct bonded VULKOLLAN® tread (93° Shore A). Plastic sealing and V-ring gasket for protection of the ball bearings against splash water and foreign matter. 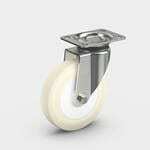 PEVOPUR® pallet rollers with ball bearings Roller body made of steel tube with ball bearings. Direct bonded PEVOPUR® tread (93° Shore A). Even the highest VULKOLLAN® quality is not always sufficient for conventional heavy-duty wheels. Today we must meet the growing demands of intralogistics at final speeds of more than 14 km/h in the case of industrial trucks and more than 22 km/h in the case of stacker cranes. 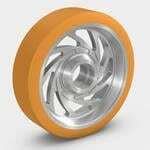 HSHL® wheels (HighSpeedHighLoad®) provide a reliable and economical solution for these use types. With the innovative geometry of the wheel center, the stress occurring in the edge area of the adhesive surface between the center and the coating is significantly reduced. The internal heating that occurs at high speeds is significantly reduced thanks to the special design. 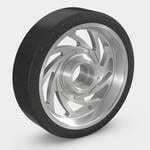 A further advantage is fewer materials are required for the production of a HSHL® wheel due to the modified structure, which reduces unit costs. We currently have no products available. 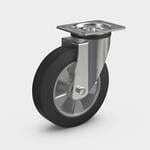 At Newco USA, we offer you an extensive range of institutional, industrial, and heavy-duty casters in the form of swivel and fixed casters for a wide range of different industrial applications. Our products are known for their excellent workmanship, high quality, and long lifespans. 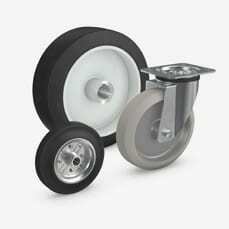 Casters are made up of a wheel, housing and axle material, and are used to make equipment or transportation systems mobile. The castor is usually attached either via a plate, a hole fitting, or a stem fitting. As passive components, they are generally not directly driven. 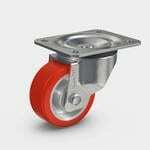 In the design of casters, we distinguish between fixed casters and swivel casters. 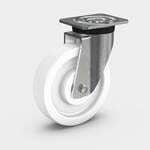 Fixed casters are connected to the device or transportation system via a rigid fastener and therefore cannot swivel. Consequently, they only operate in linear motion. 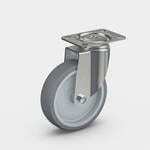 Swivel casters have a fastener that can rotate in addition to moving in a linear direction. 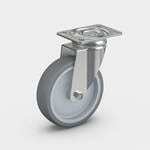 Swivel casters can also be equipped with a lock. You can lock the wheel motion using wheel locks. Directional locks, on the other hand, lock the swiveling movement of the swivel castor in one or a few defined directions. Our ALLSTOP locks, lock both the wheel and the swiveling movement of a castor. 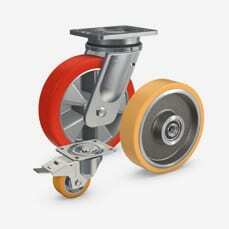 We offer an extensive range of institutional wheels and institutional castors for in-plant transportation. 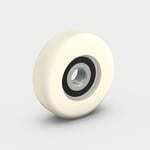 Our use of high-quality materials and components ensures a long lifespan for our wheels and castors. Different fastening options ensure flexible installation. 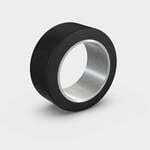 Plastic rim with non-marking thermoplastic rubber tyre with plain bearing (/1), ball bearing (/5) or stainless ball bearing (/5R). PEVOLON® rim with high-quality thermoplastic polyurethane tread with plain bearing (/1), ball bearings (/5) or stainless ball bearings (/5R). Wheels series 85 with plain bearing (/1) or ball bearings with thread guards (/5/P FAD). 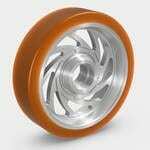 Wheels series 85 PU with plain bearing (/1) or ball bearings (/5). 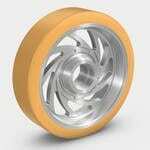 Wheels series 85 with plain bearing (/1) or ball bearings with thread guards (/5/..FAD). PEVOLON® rim with a tread made of high-quality thermoplastic polyurethane (96° Shore A), with plain bearing (/1), ball bearings (/5) or stainless ball bearings (/5R). 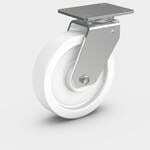 Aluminum rim with securely vulcanized ELASTIC solid rubber tyre with ball bearings (/5). 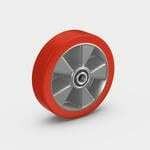 Aluminum wheel center with ball bearings (/5). Direct bonded PEVODYN®-SOFT tread (78° Shore A). 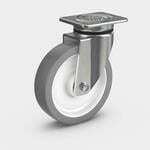 Polished stainless-steel housing, with thermoplastic rubber or PEVOTHAN® wheels, with plain bearings, deep groove ball bearing or rust-proof deep groove ball bearing, with top plate or hole fitting, on request with ALLSTOP lock, 60-125 kg load capacity. VULKOLLAN® (93° Shore A)/VULKOLLAN® hydrolysis stabilized VULKOLLAN®1 is a highly elastic, cross-linked polyurethane elastomer based on Desmodur® 15 with tear propagation resistance, the highest modulus of elasticity of all elastomers, high mechanical wear resistance as well as high impact resilience and low compression set. As a result, VULKOLLAN® is the preferred choice for use in drive wheels and load wheels in industrial trucks, materials handling and mechanical engineering. For applications in tropical environments, we recommend VULKOLLAN® hydrolysis-stabilized. 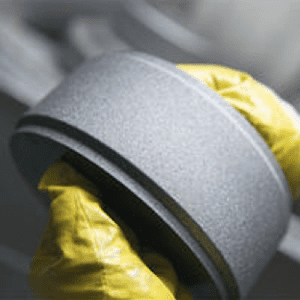 PEVODYN® is a new high-quality polyurethane elastomer we developed, which offers a significantly reduced starting and rolling resistance as well as high dynamic load capacity. The material is particularly suitable for intra-logistic applications. Thanks to its hydrolysis resistance, PEVODYN® is also perfectly suited for use in tropical climates. PEVOPUR® is a high-quality polyurethane elastomer which offers good dynamic load capacity, high elasticity, good mechanical wear resistance and good compressive set quality. PEVOPUR® is also significantly more resilient than rubber. Consequently, the material is particularly suitable for applications with lower requirements and is ideally suited for use in tropical climates. 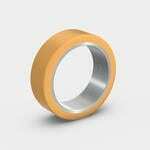 VULKOLLAN® is a highly elastic polyurethane elastomer based on Desmodur® 15. Like all VULKOLLAN® varieties, the material has excellent mechanical properties including good dynamic load capacity, good abrasion resistance and wear propagation resistance, high impact resilience and low compression set. With a Shore hardness of 85° Shore A, VULKOSOFT® combines high load capacity with good noise reduction and vibration damping and is therefore particularly suitable for use on surfaces where care is needed, for example on tile floors. TRACTOTHAN® is a VULKOLLAN® composite material developed by us with the same properties as VULKOLLAN®. Special TPU granules incorporated into the tread ensure increased wheel grip, thus improving starting properties, preventing slip and improving braking effects. TRACTOTHAN® is therefore particularly suitable for in-plant transportation and use on wet and soiled surfaces. 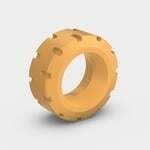 Tractosoft is a proprietary composite material for high grip. Special TPU granules incorporated into the tread ensure increased wheel grip, thus improving starting properties, preventing slip and improving braking effects. Thanks to the lower Shore hardness of 85° Shore A, TRACTOSOFT® is particularly suited for use in transportation on wet and soiled surfaces where noise reduction and protection of the products being transported are also important factors. VULKOLLAN®-Quartz is a VULKOLLAN® composite material we developed for use on extremely wet, slippery or greasy surfaces. With the addition of quartz sand, the material has significantly better traction, while the excellent properties of VULKOLLAN® are preserved as much as possible. VULKOLLAN®-Quartz is therefore particularly suited to the most extreme types of usage in the fish and meat industries or in creameries. It does have an abrasive effect due to its structure, which can damage the coating on industrial floors. VULKODYN® a highly elastic polyurethane elastomer we developed for extremely dynamic applications. 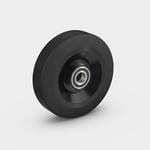 The material has excellent properties such as approximately 20% lower rolling resistance, higher load capacity at the same speeds, better driving comfort thanks to good damping, lower risk of flat spots during stoppages, hydrolysis resistance and better traction. VULKODYN® is therefore particularly suited for use at high speeds. PEVOSOFT® is a high-quality polyurethane elastomer which offers good dynamic load capacity, high elasticity, good mechanical wear resistance and good compressive set quality. 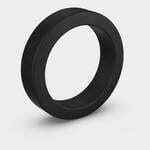 PEVOSOFT® is also significantly more resilient than rubber. 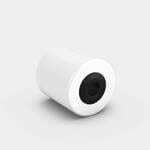 With a Shore hardness of 75° Shore A, it is suitable for all areas of application where better noise reduction and vibration damping, floor-saving usage, high driving comfort or secure transportation of delicate goods are required. The right wheel for every application. Our products drive a wide range of industries throughout the world. From the extraction and processing of raw materials, to intralogistics and through to transport and supply systems, renowned manufacturers count on our expertise, our quality and our comprehensive product range. From small PEVOLON® conveyor rollers and heavy-duty double rollers with PEVOPUR® wheels through to VULKOLLAN® press-on tyres: more than 30,000 items with diameters of 30 mm to 1,800 mm and load capacities of up to 80 tons illustrate our range of products and our expertise. All of our drive, load and guiding wheels as well as our press-on tyres, running wheels and pallet rollers must meet the highest standards every day. From short-term loads to continuous operation, in clean rooms or in mining, our products always offer you security and reliability.